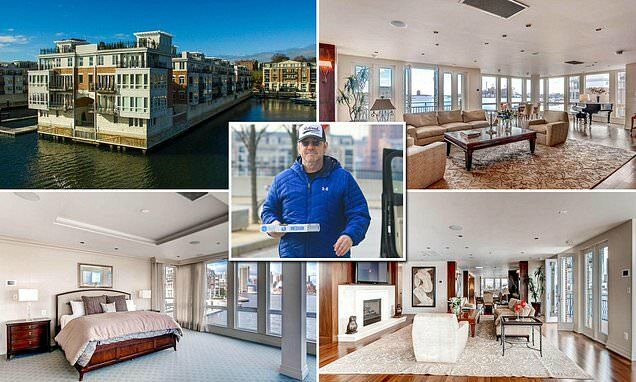 This is the $6 million Baltimore mansion where Kevin Spacey has been hiding out as he awaits his arraignment on sexual assault charges next week in Nantucket. It was purchased by his manager and constant companion Evan Lowenstein in 2017, when Spacey was still set to appear on the sixth season of House of Cards. Tax records show that the home was purchased by Clear Toaster LLC for $5.65 million after being listed at $6.25 million. The home boosts a number of luxuries and offers a secluded hideaway for Spacey, with few neighbors as the prices in the area have tumbled to record lows in recent months. DailyMail.com photographed Spacey outside the residence over the weekend, one were after the actor recorded a bizarre video about his comeback in the kitchen. The home was listed at the time of its sale as a magnificent mansion on the water. 'Unprecedented in proportion and grandeur, this 9,000-foot + pier home offers 5 levels, 6 bedrooms, 7 bathrooms, 3 half-baths with a sophisticated living experience rarely available in Baltimore's exclusive gated community,' reads one listing. It was also stated that the home could easily entertain 300 people, though it is unlikely Spacey is having over many guests. Spacey will be in court next week to be arraigned on criminal charges for a 2016 sexual assault. Judge Thomas Barrett ruled on a motion submitted by the Oscar winner and his legal team last week, which argued that the actor's appearance would result in negative publicity. The defense team's belief that Spacey attending his arraignment would 'amplify the negative publicity already generated' and 'heighten prejudicial media interest in the case' ultimately failed to pass muster with the court.